WASHINGTON (AP) — Students with disabilities must be given a fair shot to play on a traditional sports team or have their own leagues, the Education Department says. Disabled students who want to play for their school could join traditional teams if officials can make “reasonable modifications” to accommodate them. If those adjustments would fundamentally alter a sport or give the student an advantage, the department is directing the school to create parallel athletic programs that have comparable standing to traditional programs. It’s not clear whether the new guidelines will spark a sudden uptick in sports participation. There was a big increase in female participation in sports after Title IX guidance instructed schools to treat female athletics on par with male teams. That led many schools to cut some men’s teams, arguing that it was necessary to be able to pay for women’s teams. Federal laws, including the 1973 Rehabilitation Act and the Individuals With Disabilities Education Act, require states to provide a free public education to all students and prohibit schools that receive federal money from discriminating against students with disabilities. Going further, the new directive from the Education Department’s civil rights division explicitly tells schools and colleges that access to interscholastic, intramural and intercollegiate athletics is a right. Increasingly, those with disabilities are finding spots on their schools’ teams. “I heard about some of the other people who joined their track teams in other states. 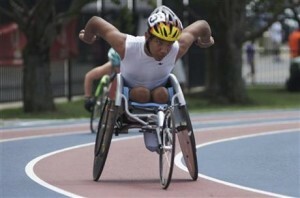 I wanted to try to do that,” said Casey Followay, 15, of Wooster, Ohio, who competes on his high school track team in a racing wheelchair. “It’s going to give me the chance to compete against kids at my level,” he said.